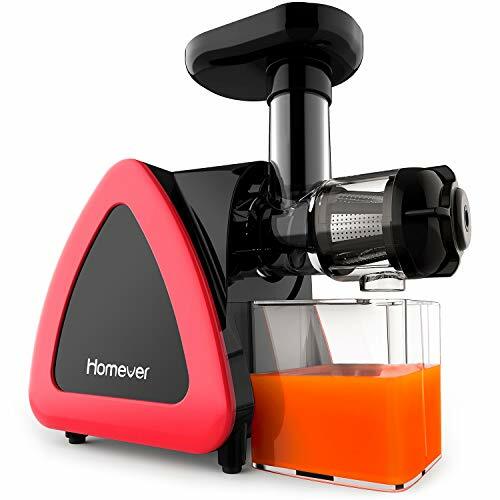 Homever Low Speed Masticating Juicer Extractor, BPA Free Cold Press Juicer — Deals from SaveaLoonie! 【Suitable for Fruits, Veggies】 The best slow juicer that can extract various of fruits and vegetables, greens in a few minutes, especially works great for greens, which allows the juice to maintain its pure color, natural taste, vitamins and nutrients. Only a few seconds, you can drink a cup of natural juice. Nourish your life. 【Higher Juice Yield And Richer Nutrition】Slow masticating can perfectly separate juice and pulp, extracting higher-purity juice and preserving higher nutritional value. Our auger spins at 80 RPM , extracts up to 25% more juice and 35% more vitamins and minerals than other centrifugal juicers. 80 rpm lower speed means no heat build-up and less oxidation. Drink the original flavor and absorb the most of the nutrition from the ingredients.